Dozens of army troops sent to the eastern Ukrainian city of Slavyansk for an “anti-terrorist operation” refused to follow orders and surrendered their weapons and armored vehicles. 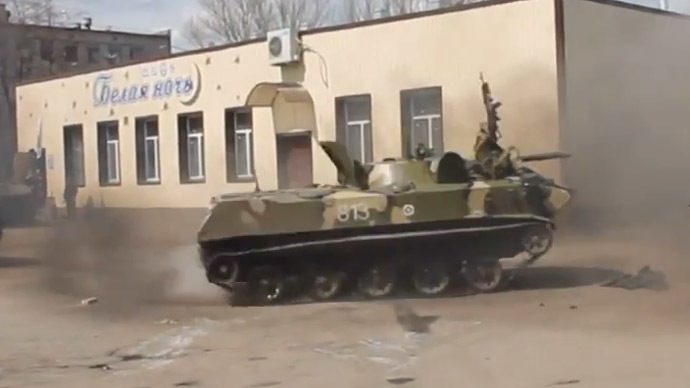 Some troops openly voiced support for the eastern Ukrainians. According to Interfax, citing local self-defense activists, some 300 Ukrainian troops agreed to lay down their weapons and “go home” following negotiations in Slavyansk. “We managed to negotiate with them. About 300 military – only some of those who closed around the city – decided to lay down their arms and go home,” a self-defense activist was quoted as saying. Reports from the scene said that the locals would not allow the soldiers to take back the APCs, but they were allowed to keep their rifles. The people were cheering the troops. Meanwhile, the anti-government activists guarding the armored vehicles have said that they did not “seize” them as the media claimed, and that the troops “switched sides” peacefully. “They were not seized by the self-defense forces. In fact, the Ukrainian troops arrived here flying a Russian flag. In this way, they have taken the side of the people,” a Slavyansk activist told Russia-24 TV. Photos from the scene now show women and children climbing onto the APCs and taking photos with the armed men in camouflage with St. George ribbons. “This morning, we started our attack, but the picture we saw in Kramatorsk turned out to be completely different. We saw in front of us a crowd of locals, mostly adults, women and men. They explained to us that there are no occupants here and there is no one to fight. Instead, they gave us food and talked to us,” the soldier was quoted as saying. Similar developments were also seen in another Donetsk region city, Kramatorsk, where Ukrainian troops began entering Tuesday after taking a nearby airfield by force, captured a day earlier by armed self-defense activists. 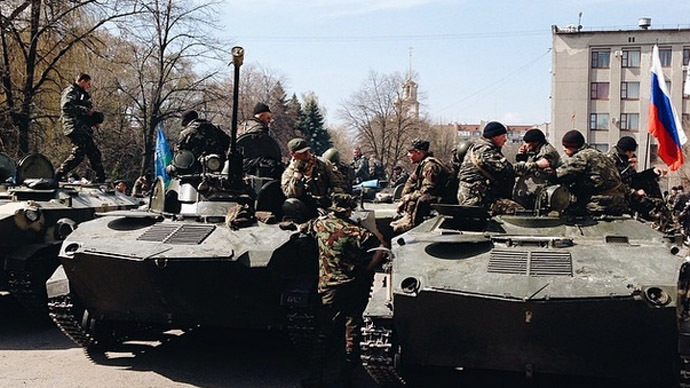 In the village of Pchyolkino, south of Kramatorsk, locals blocked part of a large convoy of armored vehicles. 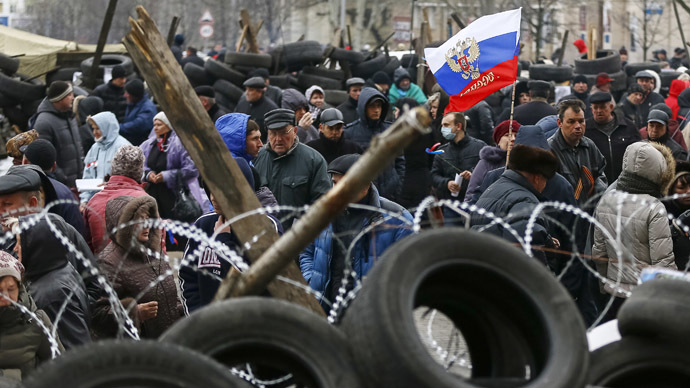 The people are demanding that the troops turn back their vehicles and leave for Dnepropetrovsk, where they are stationed. Pchyolkino residents negotiated with the blocked troops peacefully and also brought drinks and food to the “exhausted” soldiers, vp.donetsk.ua reported from the scene. “They’ve had us running around for about two months now. We’re being sent to one city, then to the next. We cannot even wash, or eat normally or rest,” one of the troops was quoted as saying. RT’s Ruptly agency also spoke with Ukrainian soldiers in Kramatorsk. According to Ruptly’s Monika Kalinowska, the soldiers blamed the media for giving “fake information” and “creating unnecessary tension.” One of the soldiers told Kalinowska that he found “no aggression” coming from the eastern Ukrainians, except for cases of few “drunks” approaching them with questions. However, not all the Ukrainian troops were ready to surrender and side with the locals blocking their way. A video by Ustream user Russian_Donetsk_2 shows a Ukrainian soldier threatening civilians who attempted to step in the way of a convoy of APCs near Kramatorsk by holding a grenade. The people surrounding the vehicles can be heard jeering the soldier. Meanwhile, the Ukrainian media has been quoting some of the troops sent to eastern Ukraine as saying they will “never surrender” to pro-Russian activists. In a separate incident near Kramatorsk, a car attempting to block the military convoy’s way was rammed and severely damaged by an APC. The driver managed to escape the vehicle unharmed. Several accounts of shooting were described in reports coming from the area later on Wednesday. 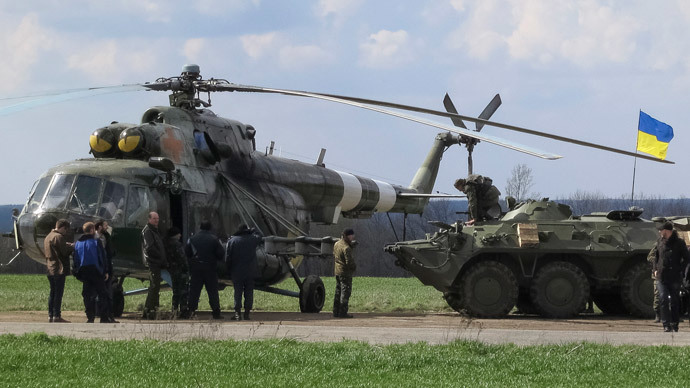 Three people were injured after Ukrainian troops heading for Kramatorsk airfield in armored vehicles fired at a car attempting to block their way near Pchyolkino, RIA Novosti reported citing anti-government activists. Local residents trying to block troops on APCs in the same region were filmed showing bullets that they say were fired by the Ukrainian military as warning shots but in the direction of the people. At least one person was injured by such warning shots, according to reports. While clearly not in favor of tanks driving through the streets of their cities, the eastern Ukrainians have particularly been disgruntled by the term “anti-terrorist operation” used by the Kiev authorities to describe the crackdown on dissent in the region. Slavyansk activist Natalya Vetlich told RT that the locals are puzzled by the military operation launched by Kiev, because there are no “terrorists” there. “Today, Ukrainian troops sided with the people – the troops that were sent to our city to suppress ‘terrorism.’ We do not see any terrorism in our city. This means, they have been sent to fight with peaceful civilians, with women and children… to fire at those women and elderly people who have gathered on the city’s square,” Vetlich said. According to the activist, the locals cheered and saw off the troops hoisting Russian flags as heroes – but first they had to give them some food. “Before we had chance to talk with the boys, we had to feed them. It is because they threw those boys at us like kittens, to fire at us, but forgot to even provide them with food,” the activist said, adding that in Kramatorsk the situation was practically the same. “Who are you at war with? With which terrorists? This whole ‘anti-terrorist’ operation does not make any sense to us,” Vetlich said. 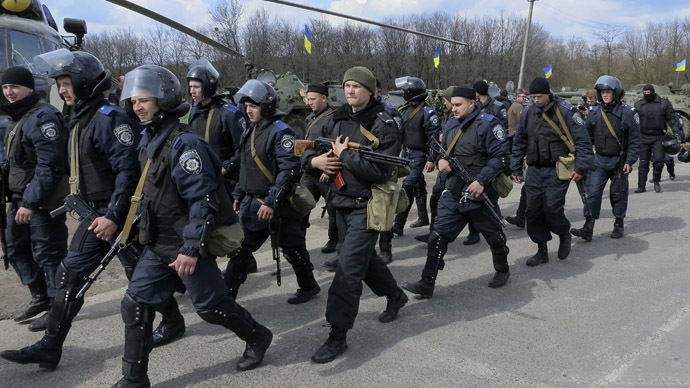 According to Vetlich, Slavyansk residents are still concerned with the recent developments, because a group of “about 14 men dressed in black military clothing” fired at and passed a checkpoint set up by the local militia. The group then apparently “changed clothes,” mixing with civilians. 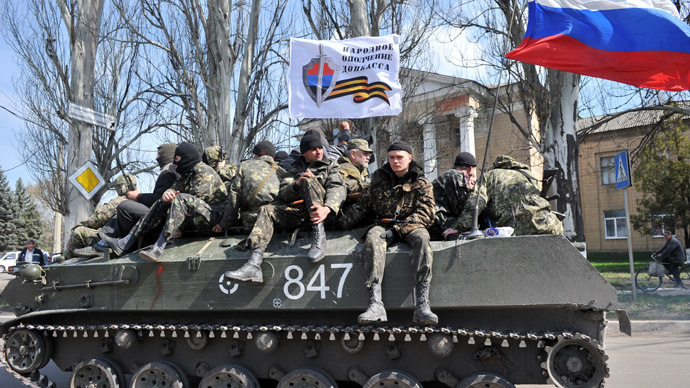 Slavyansk activists are now expecting “provocations” from unidentified gunmen, Vetlich said.